After a 5 year lay off Nora-Mx eventually managed to return to their most favourite track of all time Wroxton! Thanks to circuit owner Brian Pounder from Banbury club New Wroxton is now better still! And before racing commenced, track prep, layout and a barrel load of sun was going to make for a good days racing! Over 160 riders were keen to show off their new machines, gear and campers for 2019. There was equally as much excitement in all 6 groups and subgroups which made for some excellent racing throughout the 18 races on the day. The Pro class kept all of the spectators on their feet with a masterclass from the leading trio of Mark McLernon, George Callaway and Harry Walker with two photo finishes, on the line with attempts from the ‘NEVER give up’ Walker. But the day went to Callaway with a 1-1-3 scorecard, while the runner up spot went to Walker with a 2-2-3. It was a bit of a Walker brothers affair with Harry’s brother Alfie who’s about a foot taller than last year, still 14 years old, taking a 1-1-1 in the 250 Youth class and the only youth to clear the uphill triple. He didn’t have it all his own way though, having to come through the pack and being given an honest battle with super competitive Scot Robbie Wood. Luke Berlin took the 3rd spot in the group to round out the Youth open class. The Masters class saw Ed Davies continue his dominance but be didn’t have it all his own way when it came to holeshots as Steve Pinder from the KIK camp proved he can get out of the gate too. Irelands Johnny McKnight made it a true international affair keeping Ed on his toes all day! 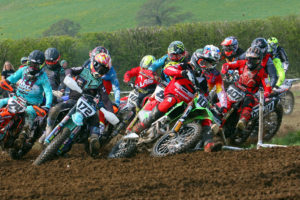 Newcomers in the 50 and 100 classes saw a debut from MXGP star Conrad Mewse sister Harriet, Finlay Bedding, and Morgan Humphreys in the 50 class. Readings Luca Shaw, the 3rd generation of Shaws to progress through Nora-mx looked stunning in his kit (Just like Grandads who unfortunately didn’t have such a good day). The Clubman class was full and equally proved a terrific class to watch, with no fewer than 7 ladies in the 2019 line up, all who will be competing for the ACU British ladies title. The next outing for Nora will be their popular two day meet at Grittenham, near Swindon on the 5th and 6th of May.